If Oprah likes it, then it must be good. If she likes it twice, then it must be fabulous. Nearly two years ago, Strauss Free Raised Veal was featured on the Oprah show as part of a story called "How We Treat the Animals We Eat." They were commended for their humane practices raising calves. This past July their veal was recommended by O Magazine in an article titled "Meet Your Meat." Well, if you don't believe Oprah (you do, though, don't you? ), then believe me when I say you should know Strauss Free Raised Veal. Calves roam freely in pastures with mother and herd. All veal is traceable to the place of birth. Recently, I received a package of several cuts of Strauss veal and am pleased to say that it's delicious. I enjoyed working with Strauss. My package arrived on time; and the meat was still cold and neatly wrapped in brown paper when I opened the package. Unlike supermarket veal, the color of Strauss veal is a deep rose color, which according to Strauss results from an iron-rich diet of the mother's milk. Once cooked, the veal is remarkably tender and succulent and intensely flavorful. So far I have made Italian-style veal hot dogs, transformed ground veal into meatballs, and made rosemary scented veal chops. All were wonderful. If you like veal and you're a conscious eater, then you should consider purchasing Strauss veal. It is sold in many Whole Foods stores and online. Strauss veal hot dogs are fully cooked, skinless, all-natural meat dogs. No nitrates or MSG are added. 1. Heat oil in a large skillet over medium heat. Add onions; saute until translucent, about 3 minutes. Add peppers and mushrooms; saute until lightly browned, about 5 minutes. Add the sherry vinegar and cook 1 minute. Season with salt and pepper. Remove from heat. 2. Cook hot dogs according to your preferred method: grilling, broiling, steaming, boiling. Steam buns by placing them in a steamer basket for a couple of minutes until soft and plump. 3. 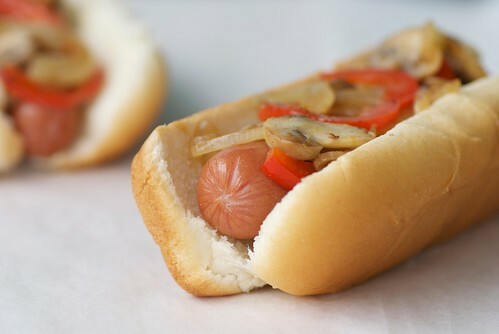 To assemble, place hot dog inside bun, and top a generous squirt of mustard and 1/4 of the sauteed veggies. Eat it while it's hot! With lots of chopped onion, ketchup and mustard. yum! Those look amazing. Hot dogs are best with onion sauce (NY style), ketchup, mustard, and saurkraut! Thanks. I like my hot dogs blackened over a nice campfire then smacked onto a bun with ketchup and mustard and whatever other condiments were on hand. Eaten with a cold beer and the smell/taste of citronella candles. Saurkraut, ketchup and dijon mustard are my fave toppings! Potato chips -- yes on the hot dogs-- and mustard. I'm from NJ and we like our hot dogs ripped; that is, deep fried until the skin rips. Put dog in warm steamed roll and add spicy brown mustard and red relish or spicy brown mustard, chili and chopped raw onions. The messier they are, the yummier they taste! Just like in your picture--onions and peppers! The best! I only buy pork, beef or lamb from local farmers who raise their live stock outside, never confined, humanely, nor hormones.... I wish everybody would pay more attention to what they consume to stop the suffering of thousands and thousands of animals. So, Thank you, for writing this article. I'm actually a pretty simple girl when it comes to hot dogs. I just want some ketchup, mustard, and a pickle. At the ballpark, it's got to be just mustard and relish. At home, it's a bacon-wrapped dog with grilled onions and hot sauce/mayo. Loaded with mustard, ketchup, sauerkraut, jalapenos, and pickle. I actually don't like hot dogs at all so I'm not interested in the giveaway (although your Italian toppings are quite tempting). But I just wanted to say how commendable it is for you to search out the most humane hot dogs! I like my dogs charred with giardinera and hot mustard. Yum. Grill the hot dogs, top with sauerkraut, mustard and onions.Yummo! Saurkraut, mustard and baked beans!! YUM! I'm always excited to hear about sustainable and lovingly raised products in my home state. I like my hotdogs hot, with a grilled or steamed bun, with a good spicy mustard and kraut. Although I'm seriously intrigued by the sonoran dog. I actually love eating hot dogs over a salad! Love diced onions and spicy mustard. Ketchup, mustard, relish, sauerkraut - preferably with a baseball game being played nearby! I like my hotdog grilled and with lots of mustard. The bun has to be toasted too. So yummy. I prefer my hot dogs cooked on the grill. If that is not an option then I go for chili dogs! grilled, on a toasted bun with ketchup and mustard. dill pickle and potato chips on the side. perfect every time. I scandelize my husband by eating them with mayo and a little relish - he believes in keeping it simple with just mustard! I like either plain hotdogs or chili dogs! Mmmm! Hmm. depends on what I'm in the mood for. If I'm feeling like being reminded of my childhood, I'll put ketchup, mustard, and onions on it. If I'm wanting something really meaty I'll put chili and onions on it. But mostly I go for simple. Charred on the outside, preferably from the grill, and topped with yellow mustard. I don't eat a whole lot of meat, but I do like hotdogs and am always on the lookout for good small batch artisan food. I slice mine lengthwise so it makes a little "bun" that I fill with swiss cheese, then top with ketchup (Heinz!) and mustard (as grainy as possible!) on a toasted bun. I have recently discovered the Sonoran hot dog, nestled on a bed of pinto beans on an extra deep bun, topped with onions both fried and raw, mustard, mayonnaise, green chile, and tomato. But these veal dogs should probably be served in a more minimal style, snappy-skinned, with just aribbon ofan exquisite mustard as an accent. Experience has taught me that only inferior hot dogs need excessive embellishment. Truly flavorful hot dogs need only a bun of substantial texture and a squirt of spicy brown mustard. Best place to eat one? Outdoors...on a blanket...in the dark...watching Fourth of July fireworks. Childhood heaven...adult, too, for that matter. I like my dogs one of two ways (I preferred grilled on a griddle the best no matter what the toppings). I eat them with coleslaw and deli mustard or with pickle relish, sauerkraut and deli mustard. Being raised in Chicago, I have to go for the classic Chicago dog. Yum. I'm a NY girl, so sauerkraut is the way to go with mustard too. I also like the cooked red onions. I'm very interested in this veal because I stopped eating veal over 20 years ago. I'm a pretty unrepetant omnivore, but veal was where I drew the line. Too bad more restaurants don't serve this type of veal. With one line of ketchup and one line of mustard down each side ... it's a little OCD but it works for me! I like mine with sauerkraut! Very interesting about the veal. I want to check them out. I like to eat a hot dog with relish and mustard or chopped onion w/ketchup. My favorite way to eat hot dogs is with my mouth. LOL ha ha ha snort. I crack my self up! OK, really my favorite way to eat a hot dog would be plain, with just ketchup and pickle relish. I have to have pickle relish on my hot dog!!! I love them with chili sauce, onions mustard and topped with a light coleslaw. Yum! As a true hot dog lover, I like my hot dogs, every way, but with the accompaniment of good friends! I'm moving to Phoenix and recently had a Sonoran style out there, with Pinto beans and bacon (WHOA!). yum, i love a good turkey hot dog with lots and lots of ketchup. at this point, i eat my hot dogs with ketchup just to spite people, even though i still think it tastes really good. i could move on to other, more sophisticated toppings, but ketchup needs love, too. Grilled hot dogs with vidalia onions and pretzel hot dog buns works really really well !! Detroit style Coney Island - Chili, onions, and yellow mustard! Yum! Oh yum! I do so love hot dogs! :-) My favorite way to eat them is on a toasted bun spread with garlic butter, a grilled dog tucked inside and topped with grainy German mustard and either Danish crispy fried onions or sauerkraut. YUM!!!! ketchup and mustard... nice and simple. I like mine with southwest mustard, baked beans, and onion. Now a THAT'S a meal! Sonoran style is a religious experience in our house. Bacon baby!! Hot dogs are one of my favorite foods, so almost any combo works for me! But I love them grilled with pickles and onions. Mmm. Sauted Onions & Bell Peppers of any or all colors,& mushrooms, Chili, Lots of Melted cheese, And jalapenos. My Hot Dog Cooked DARK on Grill or w/Torch. OR w/O the Chile and Cheee But all the other stuff I just told ya about. YUUMMMY. Are you kidding? Veal hot dogs? OMG yum. I love hot dogs Chicago style, complete with the sport peppers and the celery salt. Yum. Grilled, for sure . . . though the toppings vary.